WorldMovieStore - Castle in the Sky Sinopsis. Inspired by "Gulliver's Travels," the fantasy-adventure Castle in the Sky (1986) was Hayao Miyazaki's third feature, and helped to establish his reputation as a visionary in both Japan and America . The orphan Sheeta inherited a mysterious crystal that links her to the legendary sky-kingdom of Laputa. Disney's new English dub, which features Anna Paquin (Sheeta), James Van Der Beek (Pazu), and Cloris Leachman (pirate matriarch Dola), is lively and close in tone to the original Japanese, if a bit talkier. --Charles Solomon. Read More Sinopsis. 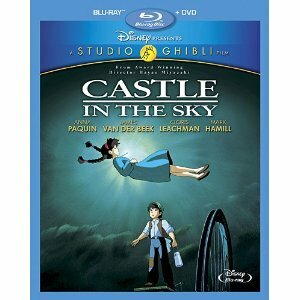 0 Response to "Castle in the Sky Blu-ray"